Each of us make a logic of our own and try to create a tribe around us and constantly seek chorus for whatever we do. Whether that actually bears fruit or otherwise, but in the process of doing, so many crazy souls create sounds of pollution that affect the liberty of others. The other day, being holiday I was little more enthusiastic to indulge more in my desired activity : reading and writing. But the two mind-intensive activities were severely dampened with continuous blaring sounds of bhajans from nearby school from dawn to dusk. My afternoon siesta was also gone. It looked that the group of people in the school stood against the colony and were silently creating enemies in the process of invoking Gods. I tried hard to understand their logic for singing bhajans in such a high-pitch tone with microphones on. The school is a stone's throw from my home, and you could imagine my plight ! I feared that such behaviour in a communally sensitive place would definitely put them in deep trouble. One need not be so pompous when it comes to bhakti or devotion. The more you silently do, the greater would be it's impact. Commenting on Bhakti, Swami Vivekananda in his lecture on Bhakti Yoga says that one great advantage of Bhakti is that it is the easiest and the most natural way to reach the great divine end in view; it's great disadvantage is that in its lower forms it oftentimes degenerates into hideous fanaticism. What that group of people who made me sleepless for half-day definitely fall into this category. Whether God would respond to their prayers or not, let this should not create mess in the lives of neighbourhood. WHAT DETERMINES THE QUALITY OF YOUR INNER LIFE ? When it comes to wisdom, you need not give a lengthy sermon. The best idea could be expressed in a few words. This is much needed, especially in one's spiritual life. The spiritual path is not a taboo for common folks. One must tread this path to feeling blessed every moment . To live means to act ceaselessly. Whatever you do, your intention should always be for the good of people. Don't break the heart of others simply for the sake of your own petty gains. As long as the intention is good, you need not worry. The doctor when he uses a knife for a patient's operation is lauded, whereas the robber when he uses the same knife to torment the householder to steal his wealth is caught and punished. Here the knife is same, but the person who uses it and the intention are different. As long as our actions help others to grow in life should not be thought otherwise. Swami Sukhabodhananda in his much-acclaimed book Oh, Mind Relax Please ! says that there are two types of actions; outer & inner. What determines the quality of one's life is the inner action - thoughts and emotions. Be alert to every moment in your thoughts & emotions and learn to relax. So act with a positive mind-frame! Enlightenment is looking for spectacles that are sitting right on your nose. In April 2011, I wrote an article on 'Listening' and that article was written from HR perspective meant for business world. I could simply say that the dimensions I discussed were from the prism of material world. Over the years, I have been carefully observing that my listening skills are not upto mark and they need to be fine-tuned to understand more of my Self than the words of other persons. The awareness goes to next level only if the help comes from a spiritually advanced person who is matured enough to give a sermon on human relations. Since my college days (1989/90) onwards, I am in the habit of taking note of great people's quotes which inspire me. The reason for writing such self-empowering quotes is that they strengthen my own conviction that I am unique. My selection of quotes is such that they not only ignite me when I read them but give the strength of thousand elephants to whoever read them. The above quote of Former British Prime Minister is one of my all time best quotes. It reflects his personality and confidence on himself. History witnessed that he rallied his people during World War II and led his country from the brink of defeat to victory. Like Churchill, everyone must have faith in himself/herself which becomes the bedrock of success in any activity they undertake. So work on your goals and show the world what you could achieve! will be cured if that blood is pure. It has been a long gap of around 7 months, I wrote my last post at the beginning of this year i.e. January 2015. It doesn't mean that I have been deviated from my path. In fact, that goal is my background note of whatever I indulge in my worldly affairs. I being a Spirit is concerned with Spirituality. To immerse in this mindset is not as easy as told. It needs an arduous practice, and tremendous mental energies are required to convince your own self. That's why Buddha says that you can win over a thousand battles but to win over your own Self is a pretty gigantic task. Wisdom is not something that is found outside YOU. You have to come Home to find it within YOU only. The life of philosophers always gives deep insights to tread our own path. 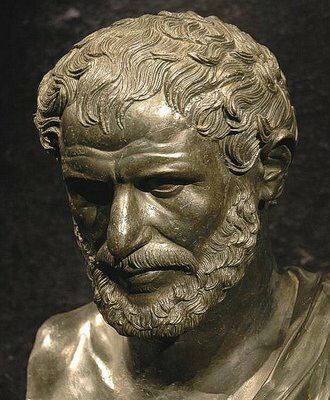 One such Greek philosopher whose profound wisdom inspires in this modern era is Heraclitus. I came to know about Heraclitus only when I read the recent edition of Osho World, a monthly magazine which carried one essay on this great man. Osho says that Heraclitus was like Gautam Buddha or Lao Tzu, but the Greek soil was absolutely not kind for him. Throwing more light on Heraclitus, Osho says that he is a really rare flowering, one of the most highly penetrating souls, one of those souls who become like Everest, the highest peak of the Himalayas. He further says that you need a different type of being to understand him. A cultivated head won't be of any help.